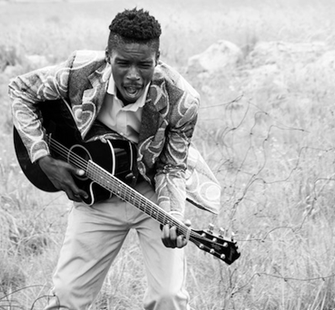 Bongeziwe Mabandla is a vocalist, guitarist, and songwriter from South Africa. While studying drama and visual arts in school, he was encouraged by a teacher to pursue music. Bongeziwe croons velvety Xhosa in a style he calls “urban traditional African folk music,” citing Tracy Chapman, Lauryn Hill, South African vocalist Simphiwe Dana, and Zimbabwean guitarist Oliver Mtukudzi as his greatest influences. His music explores themes of inequality and contemporary social issues facing South Africa. In 2008, he independently released his debut EP, UMLILO and toured in South Africa, France, Zimbabwe and Lesotho. In 2011, Bongeziwe was awarded second place at the Radio France International Discoveries Awards. In addition to working as a composer for film and television, Bongeziwe is currently recording his first full-length album.